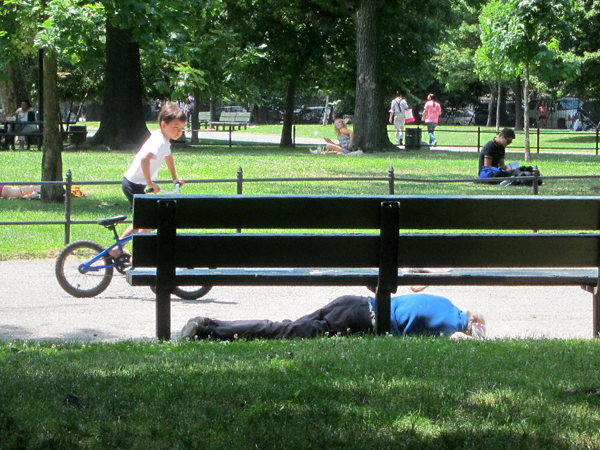 If there is one photo that best summarizes the homeless problem in this park— and north Brooklyn in general— this is it. This fellow was the source of considerable curiosity and bemused interest by parks and pool patrons as I walked by this afternoon. Concerned he might be susceptible to— if not presently experiencing— heat exhaustion/stroke, I spoke to the Parks staff at the (nearby) field house. In closing, I would like to take a moment to express my gratitude for securing the medical attention this man so clearly needed. Thanks guys (and gals)!